Very early in AEDM someone posted their art that was made by swirling or dragging a string dipped in India ink around on paper and then coloring/painting in the spaces made. I thought it looked interesting so a few days ago, I went and got some ink. I should have gotten some string, too (lol)! All I had at home was some twine which was too stiff and "hairy". I didn't know if I was suppose to drag or lay it in loops...neither worked. So I took the dropper that came with the ink and just dragged it around on a small piece of watercolor paper and then had fun using different colors of watercolor to fill it in. I could see scanning this and printing it out on card stock to make note cards. 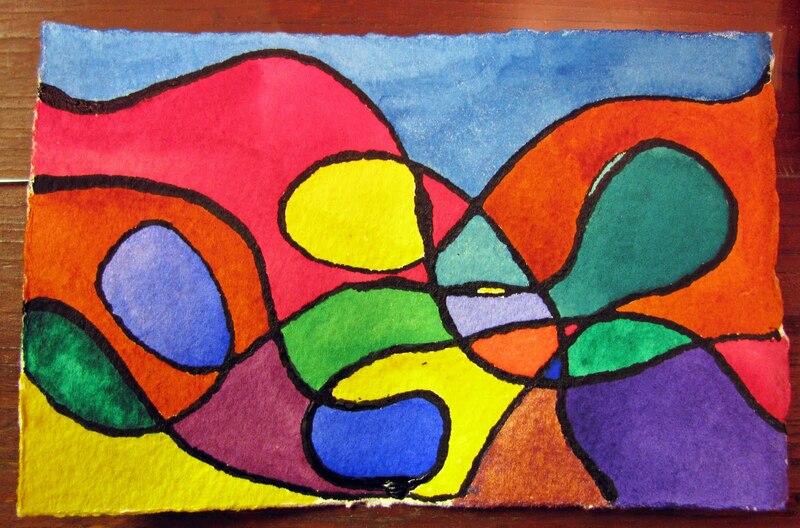 It was meditative for me, much like the zentangle/doodle was yesterday. I like getting friendly with the watercolors. It is much more fun to use them than just looking at them tubed and boxed up! My gut reaction to seeing this was the thought, "I like this." I love the bright colors. This reminds me of a project I might have been assigned in elementary school art class. I agree that this design would be good on note cards, maybe with a simple generic "Thinking of you..." on the outside, maybe not. Looks so bright and colourful I love diung these too - relaxing. Just as say - like zentangles. Cool! I love how you are getting inspired by AEDM participants to try new things. now that is really a vivd piece..I love the random feel! Susie, this looks like it was lots of fun. Reminds me of something I did with crayons when I was a kid and I remember I had so much fun doing those! Thanks for visiting my blog today. The drawing is way out of my comfort zone. I keep posting comments today and then thinking of something else to say. I bought watercolors this week. The same day that I bought the sketchbook I used for the wren tonight. I'll have to use them soon. i really enjoy all the colors-how fun!!! keep in with the fun and the experimentation sweetheart, very good indeed!